Excerpt from “Oral history interview with Beverly Pepper, 2009, Jul 1-2.” The interview took place with at Pepper’s home in New York NY and was conducted by Judith Olch Richards for the Archives of American Art, Smithsonian Institution. All text courtesy of AAA/Smithsonian. MS. PEPPER: [In 1962] I was for one month in a factory in north Italy. And David Smith, whom I had met in New York, was in a factory in Genoa. But he spoke no Italian. So he'd call me and ask me to translate things and talk to people. Well, that was an education in itself because just things he wanted to use and his equipment, etc. I suddenly was right in the middle of the art world, the sculpture world. I got to know Alexander Calder, David and I were friends, Lynn Chadwick, we became friends. I was suddenly catapulted into the real world. I wasn't in the Italian world. And it just changed my life. MS. RICHARDS: In '62 you were nearly 40. So you were an adult artist… However, this must have been a challenge in many ways as a woman. MS. PEPPER: The reason they sent me to Spoleto is they decided it was a 100 percent Communist town, and therefore they would treat me like a companion, and everybody would be equal. But what it did to me—I worked three shifts. This is typical of me. I worked the morning shift which was six to two. I'd get there and they would come with their onion sandwiches, and I would eat the onion sandwiches with them and have breakfast. And then I'd have break. Then I would work the two to ten shift. And then I would work another four hours for the third shift. I would eat with all these guys. They taught me everything. Listen, it was a Ph.D. in metal welding, metalwork. They adored me because I gained 14 pounds..I ate all those things and [other] junk. It was onion sandwiches, red wine, spaghetti, whatever they were eating. And I learned how to handle myself in factories. This was the most extraordinary thing that happened to me in my life. In fact my very first commission that I got, on Third Avenue and 47th and 48th Street, a big stainless steel sculpture for the Swiss architect, [William] Lescaze, was because of David Smith. At one point I asked Lescaze, "How did you come to pick me?" He said, "David Smith recommended you." I said, "What do you mean?" He said, "Well, I wanted David to do this thing. But he never worked in this size." The sculptures I did in Spoleto were 18 feet, 20 feet…Lescaze said, "David said he can't work in that scale, but you could." And I said, "What are you talking about?" He said, "She can do anything." It was so wonderful, and I was so touched that David had done that. MS. RICHARDS: So the welded pieces that you showed at Spoleto—how did your work evolve from there? MS. PEPPER: I was working in U.S. Steel. And I was making a sculpture for someplace in Tennessee. I now had become very involved with factories. And the Steel & Iron Institute or something like that sponsored me. They gave me very thick steel, but there was no way to cut it. So I decided to try to cut them by overheating the welding. And therefore I had these very rough edges. And actually Fontana, Lucio Fontana, for my first show at the Marlborough, Rome [wanted] to buy one of [my] works. And I said [to the gallery director] "well, tell Fontana that I'd rather trade with him." And to my horror, he said, "No, he wants to buy it." And I thought, I just want to trade. Then he laughed and said, "And then he'll trade with you." I only realized afterwards—because I was so ignorant—what Fontana was interested in was what I was doing something he was doing with holes and things like that. And he was very interested in how to do this. The truth is, to be able to have done that, A, you had to have that kind of steel; but you needed industrial equipment to do that. And that was only because I was at U.S. Steel at the time. But they were wonderful. MS. RICHARDS: What about the use of color on those works? MS. PEPPER: Well, I was now working in America, and it was at the beginning of Pop. And I'm not impervious to what goes on around me. And I assume that—there were problems. There weren't a lot of burnt areas on the inside. And it was very difficult to clean them. And also, the burns looked very interesting. I tried to figure out how to keep them and I decided to put color in them. I also, I must tell you, that I'm the first person—the first artist in America—to use Cor-Ten. And that I did in 1964. Because U.S. Steel said to me, because, you know, they liked me. I was this good-looking kid. "Beverly, why don't you try this new material we have. It's Cor-Ten." Now, Corten is a brand name, which you get—Bethlehem Steel had different numbers, etc. By calling it Cor-Ten, U.S. Steel really had the market because it was a name. And they gave me these pieces of corten. And I made a work that actually Charles Cowles's mother bought it. She's given it to some museum now—she's now quite old. 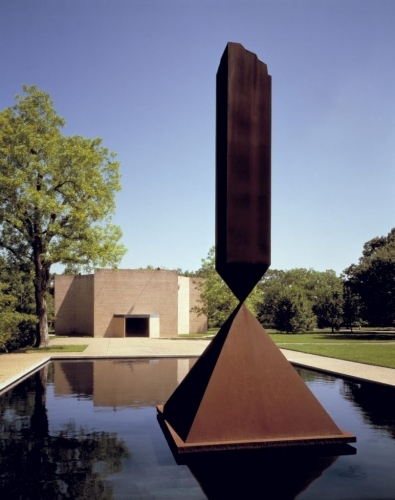 When Barnett Newman was working the obelisk that he did, he asked [about the patina.] I went with him to, I guess it was Teitel Geitz where he was working. They didn't know how to get the patinas. So Barney and I went there and showed them how I did the patinas. And why did I know how to do the patinas? Because I was working in U.S. Steel with the people who invented it. 24' 7 1/4" x 10' 5 1/2" x 10' 5 1/2"
And then when the Cor-Ten disintegrated, I called U.S. Steel and said, "What's going on?" And they said, "Ssssh." Sculpture all across America disintegrating. Because Cor-Ten—we artists didn't use heavy-duty. We used very thin sheeting and a few— If it was anywhere near the sea, or anything like that, it just corrodes right through. Now, when I use it, I use very heavy-duty, thick Cor-Ten. But I prefer carbon steel because it's orange and changes its color with the weather. MS. RICHARDS: The color that you used in these pieces on the inside, were they your silence references to Pop art? MS. PEPPER: I wasn't aware of that. I realized I absorbed it. It was not that I said let's put the color in. MS. RICHARDS: Besides Calder, were there other sculptors who were using color, abstract sculptors? MS. PEPPER: I never thought of calling it using color in the sense of—because I used the color always with the raw material. MS. PEPPER: It was very different. The stainless steel, you always had the outside. I used color in the inside to try to, in some way, emphasize the material that the work was made of. 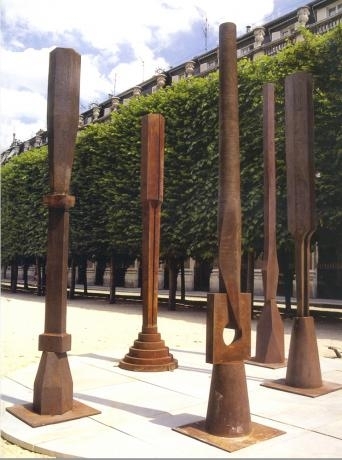 MS. RICHARDS: When you were working after '65 and making these large stainless steel pieces that were outside, what was the initial inspiration for taking that leap to those pieces that were involved with different formal concerns? The positive and negative and the mass and the scale and all of those issues that those pieces— And the fact that they were outside in the landscape? MS. PEPPER: Well, I'm trying to think of the first stainless steels I did, were the ones that were flame-cut or whatever that was. And from then they became fairly geometrical. 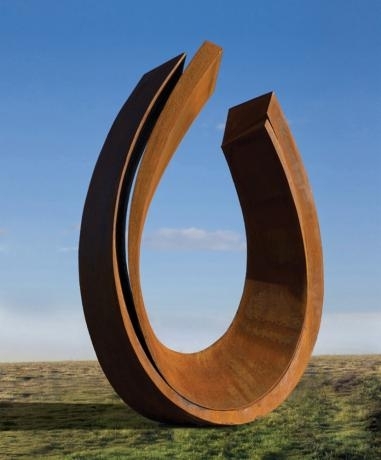 And that's because I— That all started at U.S. Steel while I was making the sculpture for this place in Tennessee. And so I became acquainted with stainless steel at that time. When I built my first boxlike structure, the grain is [inaudible] of the stainless. Either I ground it—people don't understand. 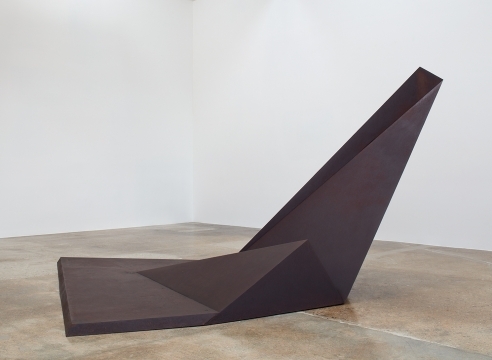 David Smith's bronze sculptures, he never—there's no design he did. That's the way when you grind a sculpture, you want to get off the welding, that's what happens. You decide whether you want to have that welding, those circular things, etc. If you want to have them, then you look like you're doing a David Smith because that was his— But you had no choice. Once you welded a seam, you grind it off, you immediately have that pattern. And I was very concerned about being accused of taking David Smith's patina. Though people have always associated me with David Smith, my work really—I loved his work, I must say. He influenced me in many ways, but not in terms of taking his work. I kept trying to work against it. And one of the reasons for polishing them was that I tried to figure out what to do with the seams without grinding them. And that was once again very serendipitous because by then I had already done the Cor-Ten piece that had been painted and the other flame-cuts that were painted. So when I ground— When I did these and we polished them, I realized that something extraordinary—this is once again the divine accident— When it was [inaudible], it absorbed completely the landscape. That led me to saying, why don't I just use the landscape rather than have it as an image? So that led me to using grass instead of having absorbed that, you see. My work is really like compound interest. The first work always influenced the next work. If you go through all my work, you'll see. I gave a lecture once. And I was trying to show this, and I found a photograph of the inside of one of my stainless—actually the one at Albright-Knox—that I put, just that detail, I put on top of one of my triangular ones. And it was exactly that shape. I still have it. So there I was, I was now using the insides instead of the outsides. One area it didn't is when I moved to forged work. That was a decision. What happened there is that I happened to be passing a—once again I'm going to have to translate it for you—where metal was thrown away. People used metal and things. And I walked in, and I saw these extraordinary molds that were cast iron. And I didn't know that they were cast iron. I thought that they were forged. So I went to a place and asked them to teach me, show me how to forge things. And for about a year I made forged sculpture. But I realized I am not physically capable of doing that. It's very, very hard work. You have to be a big man. Even if you use a dropped forge with your feet, you still have to hold the metal and turn it. And I was covered with burns. So I had to find another way to do that. So I started casting in iron. Once again, you'll find very few people in America cast in iron at the time I started, which was also in the late sixties, when I started casting in iron. And iron is my favorite material. MS. PEPPER: Yes, I just love iron. The reason I'm not using iron these days is that at each stage of one's life, you must have reality. And the reality is that I can't make those big things physically out of iron anymore. I just don't have the— And I don't want anyone else to do anything that has textures—it has to have my handwriting. And when I worked with plaster, I worked directly with my hands. And, you know, it's very good; you have soft hands from it. So you have my fingerprints all over it. 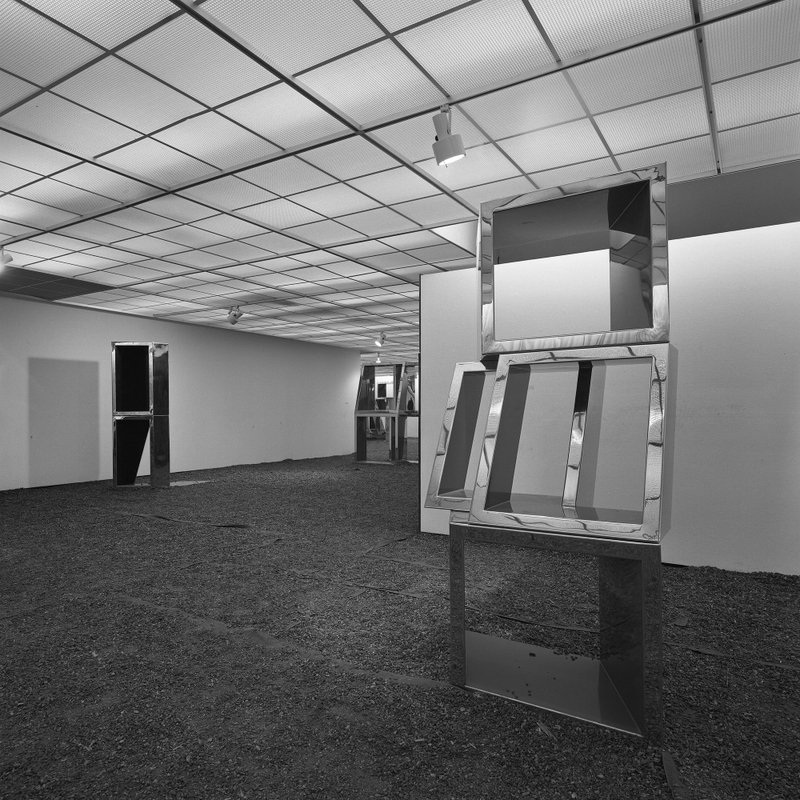 Installation view, Beverly Pepper, MCA Chicago. Photo: © MCA Chicago. I have a very bad back, you know. I'm going to be 87 years of age, and I've been working with those heavy materials for a long time. So that I have certain things I can't do. But that's fine because it leads me to do something else. Makes me invent another wheel, you see. Which is the interesting thing about it. 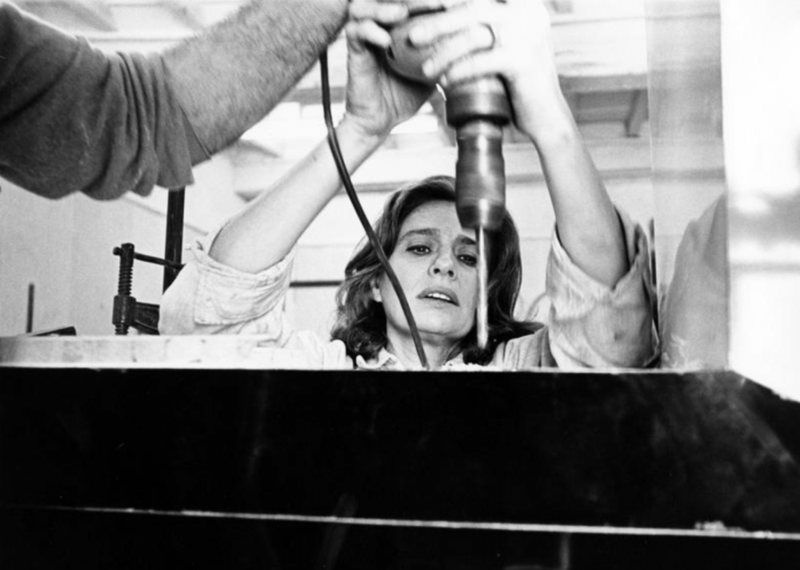 MS. RICHARDS: After the works, the stainless, there was a period of work, I think it was the late sixties, where you really felt it was a breakthrough using the stainless. That's the period you're talking about? And then I think that led to a touring show, at the Museum of Contemporary Art, Chicago in 1969? MS. PEPPER: Yes. Well, that was my first Marlborough show. And they were all big stainless steel—very big things. And most all those works were sold to museums. MS. RICHARDS: Right, 1969. I see. [Was the Albright Knox your] first major museum exhibition of sculpture in the U.S.? MS. PEPPER: Douglas [MacAgy], he organized this show called "Plus by Minus," for the Albright-Knox Museum. And he had seen a work of mine in Italy. And I got a call from the gallery in New York saying that he chose that work for the "Plus by Minus" show. That was my first really big recognition kind of thing because the Albright-Knox bought two things from that show. But what's very important about this stainless steel is how it led directly to the work that most people aren't aware of because where I use the land, I do so much land work. MS. RICHARDS: Yes. So in the early '70s and 1970—the image is the stainless steel? MS. PEPPER: That was how I broke with Clem Greenberg, among the things. And the way I broke with Clem Greenberg is that Clem Greenberg, who wanted to be a big supporter of mine and loved my work, said to me once that women can't be great sculptors, but you may break the mold. I made a sculpture which now is at the Albany Mall [Compound, Albany Mall, Albany, NY] that went like this, and then down. Clem wanted me to take away the things that went along the ground. And I said, "I can't." Now his relationship to almost every artist he supported was that he was their editor. He went in— I mean he'd go in to Helen's [Frankenthaler] place, and she'd put her things, and he'd figure out where they're going to cut it. He told all the artists except he didn't get away with that with Sonny Carroll. But certainly with Ken Nolan, all of them. And I was very distressed because I knew I was about to cut the cord. But I said I couldn't possibly take that off. That was the whole—it was a very important thing; it was a continuity that started at the floor, it went up, around, came back down into the floor. In fact I was right because that led me to putting things under the ground and into the ground. Had I not done that piece, I wouldn't have gone into the ground for a long time. But there are seminal pieces in your life, and that was a seminal piece.